A hybrid vehicle is a vehicle that combines more than one power source to drive the vehicle. The most popular type (at the moment) combines electric energy and an internal combustion engine. An all-electric vehicle (like the Nissan Leaf or Tesla cars) is not a hybrid since its only power source is from the battery pack. Hybrids work in a few different ways. Typically, a battery powers an electric motor until the car reaches a certain speed and then a small internal combustion engine takes over. The internal combustion engine can also act as the primary drive system if the battery is depleted. Chevy's Volt works a little differently in that most of the time the electric motor is propelling the car and the internal combustion engine is keeping the battery fully charged (or attempting to do so). If you are looking to get into a hybrid purely to save money, you might be barking up the wrong tree (er, driving down the wrong back road). It is true that hybrids are coming down in price and the government is still offering some subsidies, but how much you save all depends on how much you drive. One of the added benefits of a hybrid beyond maybe saving money, however, is they generally pollute less. Sometimes it's a lot less. And that's a breath of fresh air. 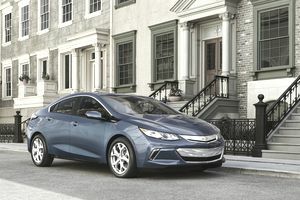 All new for 2016, the Chevy Volt is looking to make significant changes in order to stay competitive and to raise sales figures. It has yet to be the seller Chevy hoped it would be. Honda's best attempt at chasing down the Toyota Prius and according to this review, it comes ever so close. You could even say it beats the Prius, in a way, because the Accord is big, big car. Ford's attempt seems like an honest one, but it just can't match the Honda Accord or Toyota Prius when it comes to fuel economy. But it's not always about the numbers, right? Well, Ford hopes that's the case. Still, the C-Max is not another wedge-shaped driver. It's European through and through and maybe that'll be enough to spark some interest. Do you want a German car that gets the fuel economy of a hybrid? Up until now, VW's answer was: try our latest diesel car. But Americans are a funny lot and we don't want ​to use diesel. We want our gasoline burning cars. We just don't want them to burn that much gasoline. For 2012, Toyota busted out the Prius from a single car to a whole car brand with its own lineup. We're talking the small wagon with the Prius V, the compact with the Prius C, and, of course, the standard Prius (the one you've seen for years and years, albeit with a nip and a tuck over the years). It's still king of the hybrid but every maker is getting closer.